What's your Perfume Personality! Do you Know? Head over to Parkson Pavilion girls! there's a campaign going on called ASCENT Find Your Perfume Personality from 29th April to 5th May (Level 3 Parkson Pavilion) to find the perfect perfume for your personality. I was just there this morning for the launching and it was quite interesting finding out which scents suited my personality via a ipod program whereby you select the images, sounds and scents that reveal the real you. So yeah I choose the images that I like the most or felt that was me. They even let u listen to the types of music available and you have to choose one that rocks you. After a series of images, the final step would reveal which perfume personality you fall under - Casual, Sophisticated or Seductive? I got Casual and Sophisticated, so Betty (remember her from KLCC Parkson!) whipped out 2 different scented samples for me to smell. One of them was casual and the other sophisticated. I was more attracted to the casual scent which kinda smelled like apples, fresh yummy apples. Then suddenly Betty revealed to me that my perfume personality= DKNY's Be Delicious Green Apple! (OMG I love the green apple perfume!!! XD luv luv). It's fun! Buaya Wing said this is like remember when we use to fill up questionnaires from teen magazines (usually very girly and full of pictures of hearts and stuffs) to find out which perfume suit us, or which personality are we (after calculating the points). DO you remember there's even one where we can find out which guys suit us? (lol). my perfume personality is Casual!!! that's just so me! This is the first campaign of it's type in Malaysia! Let's get back to basics and find out more about ourselves before we buy the wrong perfume! (distracted by packaging, free gifts, colour? lol). Tell me your perfume personality and which perfume it is! 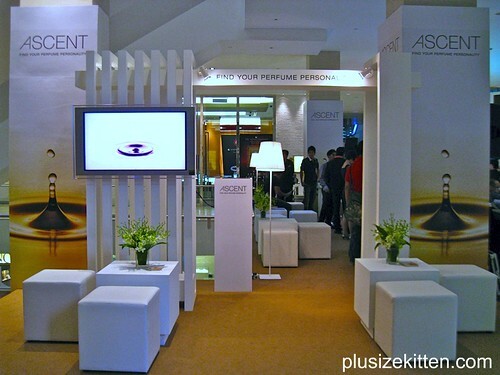 Ascent Find Your Perfume Personality 29th April - 5th May, 2010 Level 3 Parkson Pavilion. The perfume personality test takes about 10mins or less and then the perfume specialist will answer any queries you have. wah i also wanna try! I just added you in my blog and i love your blog. btw, i am carven ong' pr and marketing manager. Suzanna: after u try let us know what personality u are!